N26 is Europe’s first Mobile Bank with a full European banking license and is setting new standards in banking. N26 has redesigned banking for the smartphone, making it simple, fast and contemporary. Opening a new bank account takes only eight minutes and can be done directly from your smartphone. Users receive a Mastercard to pay cashless or withdraw cash all around the world. They can block or unblock their card with a simple click and send money instantly to friends and contacts. 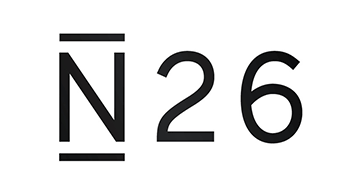 N26 was founded in early 2013 by Valentin Stalf and Maximilian Tayenthal. In two years N26 has acquired more than 500.000 clients. It operates in 17 countries: Austria, Belgium, Estonia, Finland, France, Germany, Greece, Ireland, Italy, Latvia, Lithuania, Luxembourg, Netherlands, Portugal, Slovakia, Slovenia, and Spain and currently employs 290 people. Since January 2015, N26 has been available for Android, iOS, and desktop. N26 has raised more than $55 million from investors including Li Ka-Shing’s Horizons Ventures, Battery Ventures and Valar Ventures, in addition to members of the Zalando management board, Earlybird Venture Capital and Redalpine Ventures.